The main selling points of the Canon Rebel XTI 400D are the 10 Megapixel sensor with a DIGIC II image processor and the inclusion of Canon’s integrated cleaning system. This helps protect the internal workings of the camera by reducing, repelling and removing dust. What Canon didn't include on this model is Liveview. 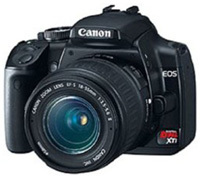 This isn't available until the later model, which is the Canon 450D Rebel XSI.